Prevention, behavioral health and mental health awareness keynote speaker Derek Clark shares his powerful and inspiring life story of surviving brutal child abuse and then growing up in the foster care system for thirteen years. His motivational and inspirational keynote speeches detail how he overcame limited thinking and the strategies that he used to have better mental health and work through his P.T.S.D. As Derek states, we need to understand important functions of prevention in behavioral health and the need for prevention efforts to align with developmental stages for effectiveness. Prevention efforts need to be made a priority. Here is an interesting statistic… one out of five adults in the Unites States has to deal with a case of mental health each year. This is further buttressed by a 2014 SAMHSA report on behavioral health which that, within a single-day survey, over 1.25 million people enrolled to be treated for substance use. Substance use or mental disorders can greatly impact behavioral health (which has to do with a person’s mentality, emotions and decision making). In addressing these disorders, prevention has a crucial role to play. And, since mental disorders usually go hand in hand with substance use disorders, successfully preventing either of them can have a positive effect on the other. Also, the factors that cause both disorders are so related that, if one of them is successfully controlled, the other might just fall in place naturally. Take for instance, you find a way to improve mental health; substance use is likely to follow suit, and vice versa. On the other hand, mental and physical health are also intertwined, and whatever happens to mental health often tells on physical health. This means that a mentally healthy person is most likely to be just as healthy physically. In the same vein, disorders with mental health or substance use can equally translate into physical health challenges. Interventions can either be aimed at individuals or a group of people. As a result, when designing prevention approaches, in prevention practitioners must take into consideration, the risk and protective factors that affect individuals as well as a group of people. This would ensure that the right approaches are followed and will consequently yield best results. When talking about continuity in terms of care giving for those with mental health or substance above disorders, prevention is a very important factor; perhaps the most important. There are four factors in total (promotion, prevention, treatment and recovery) which each have a role to play in addressing behavioral health issues and bringing about total rehabilitation of those affected. In the prevention stage of the rehabilitation exercise, before implementation, practitioners examine relevant risk factors and also come up with protective measures. A 2009 report from the Institute of Medicine showed that, of all people suffering from mental or substance use disorders, about fifty percent were discovered when they were 14 years old and that only 25 percent were discovered after age 24. Proper intervention during the window of opportunity (the time between when the symptoms first begin to manifest and when the disorder is diagnosed) can go a long way in preventing the development of the disorder. However, it’s important to ensure the suitability of the intervention technique to the target population. The developmental needs and competencies of people change as they age and for this reason, there is no “panacea” prevention technique. With a developmental approach to prevention, the practitioners can properly align their efforts with the developmental needs of their target population. All people can’t possibly develop competencies at the same rate and a lot of factors are responsible for this. One of them is the fact that, during their developmental stages, the risk and protective factors experienced differs from one person to another. For example, people who were victims of emotional abuse when they were kids are more vulnerable to mental health or substance abuse disorder. People can develop competencies in many different places such as school, home, worship centers and other places in the community and each of these settings has a role to play in a child’s development. For this reason, it has become imperative that, when prevention practitioners have identified the need for an intervention, they must also consider in which of the settings it is most likely to yield best results. If you are looking for a dynamic and inspiring keynote speaker to motivate your next conference or employee event, book Derek Clark. 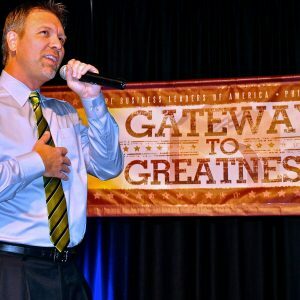 He is a popular motivational speaker and author of seven books who shares his incredible life stories and lessons that he’s learned by connecting to the power of vulnerability and determination.